Hello! Welcome to Kranken Signs Vehicle Wraps in Charlotte NC, let us expand your advertising horizons and take your visual advertising to the next level! You’ve probably heard of car decals and vehicle wraps and seen them driving around town. But have you ever stopped for a minute to think how those awesome advertising car wraps came into being and how they can help you GROW YOUR BUSINESS?!? Yes, car decal and vinyl decal advertising is everywhere. But they are not all created equal and some, sadly are not as effective as they could be. Some have information that is too small to see and some are too faded with old out-dated photos and some have obsolete information. Some times you’ll see one as it passes by—and the message doesn’t get to you. Chose our team at Kranken SignsVehicle Wraps and we’ll make sure that doesn’t happen to you. We can answer this question with a resounding YES! “Have you ever seen truck wrap graphics in your area, car decals on vehicles or bumper stickers that informed you about a particular business and then found yourself calling that business?”. The answer is yes. 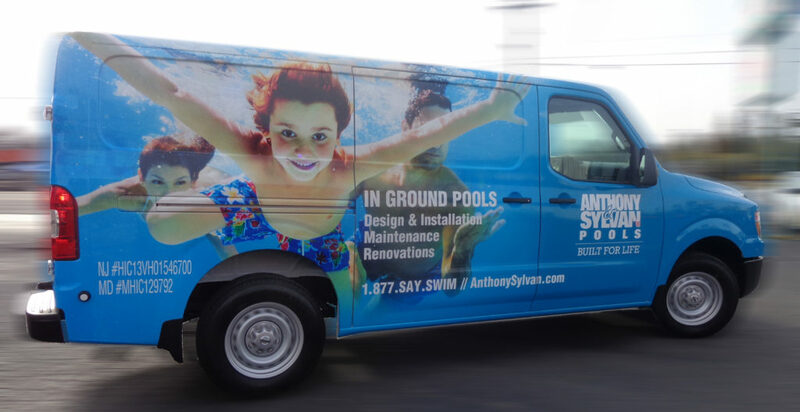 The ability to drive sales with your vehicle wrap advertising makes this the single best advertising investment that you can make. People will notice everywhere you go, day and night, 365 days a year. In fact, our customers say that as much as half of their customers base were acquired from their vehicle graphics! And if we can illustrate to you the effects of vehicle wraps in numbers, our estimate (according to research) is that your vehicle wraps advertisement can get you up to 600 impressions for every mile you drive. That’s a much more efficient way to attract customers than any other advertising medium, and this kind of advertising works in practically anywhere, everywhere and all the time. Not only do vehicle wraps promote your business to the general public, ad wraps also drive your offline marketing in an effective way too. There are thousands of reasons to choose vehicle wraps advertising, and if we have to choose one to put here – it will be the impact it makes in the minds of your potential customers by the authority the wrap grants to your business. The best part is that your vehicle wraps won’t cost you a fortune, even if it’s a fleet of 5 or more vehicles. They are known to be the single most cost-effective advertising medium that gets you the ultimate bang for your buck—n other words the single highest return on your investment. Owning a wrapped vehicle has never been any easier, thanks to Kranken Signs. Yes, that means you can be a little bit more content with being stuck in traffic and you will feel more confident knowing that your vehicle has been transformed to a moving advertisement billboard that sells your products or services in the best way possible everyday. While some people refer to car decals as ‘advertising stickers for cars’ and others know them as ‘custom window decals’, there are a lot of names that can be applied to your commercial vehicle wrap. At Kranken Signs, we specialized our array of services to help broadcast your message and get people talking about your business. You track the response from your local audience on your vehicle wraps by setting up a specific phone number, email or website that only people who see your wrapped vehicle will see. That way, you will be able to see how a single vehicle wrap is working for you. The 5 Reasons You Need To Get Your Car Wrapped THIS MOMENT! Still a bit skeptical about the vehicle wrap effect? At Kranken Signs, we work with the best car decals material which are printed with vivid state of the art inks, vinyls, laminates and equipment. Our designs are superior and as a result it’s something your audience has never quite seen before. Literally, your vehicle is about to stand out from every other branded or wrapped cars on the road. Whether you own one or six vehicles, there are a lot of customers that still haven’t heard about your business. Thanks to our car decals, that number will change – and you can reach over a seventy thousand viewers per month! If we put these numbers to practice and estimate a 1% conversion rate, that means 1,000 people could likely contact you with interest in your services! The entire world has shifted to mobile over the past few years. Which is why your business has to do the same thing. 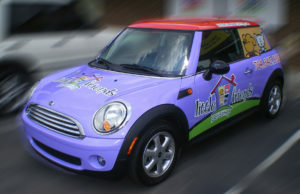 Car wrap advertising is unlike any print or radio ad that stays on a billboard or near your favorite store. It’s a thing that moves, and a thing that can expand your marketing to a newer audience each time you drive through a certain neighborhood. We don’t have a vehicle wrap price list because every project is different, but call us and tell us what you envision and we’ll be happy to ballpark it for you. 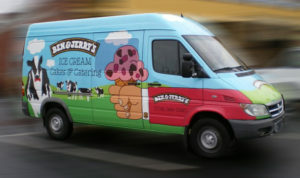 vehicle wraps graphics are among the best ways to ramp-up your local advertising and target more people. On top of that, they are cost-effective and non-aggressive. In other words, they travel into the view of your potential customers only – and don’t cost you a fortune while reaching out to customers over all roads and neighborhoods. Think of custom car wraps however you want – but car decals, bumper stickers and vehicle wraps altogether aim to protect your ca paint and vehicle’s body from scratches and small dents from the road debris. We all know that these things are the common enemies of every business owner. So, why not keep your vehicle in better condition while using them as your most powerful marketing method? Get Started With Your First Vehicle Wraps Advertising Today! Having a car that is not marketing your business is just like having a baseball bat and never hitting a home run. So, don’t let this chance pass you – use our truck wraps designs advertising for your business. For a consultative vehicle wrap pricing and design conversation – call us today. Contact us now at Kranken Signs Vehicle Wraps Charlotte for more information! Looking for the best vehicle wrap installers Charlotte? We invite you to compare our vehicle wrap printing and installation quality with any other local Charlotte vehicle wrap company. Ask about our worry-free vehicle wrap management program. We offer design, consistent color hi quality printing, distribution and expert installation from coast-to-coast.